I Buy Way Too Many Records Dot Com: Crocodile God - Two Days 7"
There have been a handful of records on my wants list for years and years. Several approaching the 20 year mark. The ones that have been there for the longest were from bands that have a small, but passionate fan base. The rarity wasn't as much from hordes of people wanting the same record, but more from ultra small pressings and an obscurity that kept them off the radar a bit. In an insane bit of luck, I scored two of the top three records on my wants list within the span of a couple of weeks. It was all kind of crazy as I have literally been looking for both for at least 18 years. 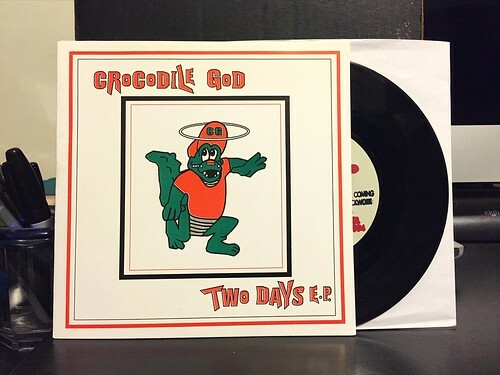 Number three on the all time sought after list was the Two Days 7" from Crocodile God. You've heard me talk at length about the mid 90's punk scene from the UK and my undying love for bands like Broccoli, Hooton 3 Car, Chopper, Skimmer and more. Crocodile God was right in the mix with those bands having released some singles on Crackle Records along with their full length and a 12" EP. I first discovered the band through their second 7" Boss in 1996. At that stage I was pretty much buying anything that Crackle Records put out as aside from the band Toast, I adored everything they were releasing. I was pretty impressed with that record and those songs appeared on many mix tapes I made at that time. But what really blew the doors down was the band's fourth 7", Ladders. Those songs are absolutely amazing and that record stands as one of my absolute favorite 7"s from the 90's. I'd been hunting for their debut 7" ever since, including multiple trips to the UK searching through dozens and dozens of record stores. And sure, I have a complete Mega City Four collection as a result of those trips, but man did I want that freaking Crocodile God 7". When I found the second biggest record on my wants list, on a lark, I decided to mention that I was still searching for this Crocodile God 7" on Twitter, tagging a few pals from the UK just to see in any of them had any leads. Well much to my surprise, the main man from Crocodile God himself Mark "Guitar" Murphy (he doesn't call himself that, but he really should) stepped up and agreed to send me the one extra copy of the record he had squirreled away. On top of that, he wouldn't even take any money from me for it. Punk rock really is the greatest thing on earth. I've been involved with people into this type of music for a really long time and I am never not amazed at what incredible, genuine people they all are. I'm thankful I have such great taste in music as it really has led to so many wonderful things in my life. That's a lot of story telling and not a lot of talking about this specific record. I had heard all of these songs before from the Crocodile God singles collection. So getting this 7" was not as much about obtaining the songs as it was tracking down a piece of history that I was missing. That being said the songs are all still quite good after all of this time. I think the band definitely improved as they went on, but if you compare it to the debut 7" of one of my other favorite bands at the time, Chopper, Two Days comes out on top. Opener "Kamarrah" has all of the speed, vocal melody and change-ups that really defined Crocodile God throughout their time. In 2015, you cringe a little bit at the quick "oi oi" part at the beginning, but hey, Snuff was doing it at the time too! "Still Bleeding" is a ten million mile an hour punk rock ripper. "Coming From" is probably my favorite song of the bunch as I always felt the band was at their very best when they slowed things down just a little bit and showcased their knack for catchy hooks. And finally "Clockwork" is a short closing blast with more of the tempo shifts that the band was always so good at. It's just an amazing thing to have this record in hand. It's the completion of a nearly two decade long quest and the fact that it was just sent to me as a gift by another long time punk rock makes it that much better. Thank you Mark, both for all of the years of great music and for sending me this record. Everyone should also know that Mark's current band. The No Marks, just happened to put out one of the best records of 2014. So everyone should go buy that and then start hunting down some Crocodile God 7"s. A warning though, it may take a little while to find Two Days.